UPDATE: I want to apologize to Ann and anybody else who felt unwelcomed by my middle-of-the-night mild frustration reflected in my words in this post (which I've edited a little). One thing to note as I ask for forgiveness: the timestamp on a blogger post shows when the post was begun; I actually finished this around 3am. I promise I wouldn't have taken the time to assemble all this info in the middle of the night if I didn't care deeply about welcoming folks from my Anglican tribe into the emerging church conversation, and I honestly am deeply sorry to have made folks feel the opposite of welcome. There's nothing wrong with studying "emerging church", reading books by folks like McLaren and co., and discussing it with other folks who share an interest, but aren't directly connected with the conversation. I did that for years before I stumbled upon a community of emerging church folk five minutes from my home. But I stand by my challenge that you will not really begin to get it until you make direct contact with this web of friendships. "Emerging church" is this web of friendships, plus a whole, holistic worldview shift that is shared (in one form or another) by the folks in these friendships. It's not just a new style of worship or a new type of ministry. Again, I hope anybody whom I've made feel unwelcome will forgive me and, if you're interested in what you've heard or read about the emerging church, will reach out and make contact. You should expect to feel welcomed - I fell down in that regard - but you should also expect to be challenged. There were a whole bunch of clergy attending the emerging church discussion group and I think out of the people there I had the most experience in it. Mike, you're so much more well versed in it as a whole--would you be willing to post a comment with links that the clergy I then pointed to my blog could access for more understanding? So my first recommendation for any clergy (or others) seeking more understanding of the emerging church movement/conversation/whatever: please don't expect to find it on the other end of these links. Unless, that is, your next move after doing this research is to actually reach out to somebody (or bodies) in the movement and establish some kind of relationship with them. It could be in person (invite somebody to your church, or visit theirs, or invite them out for coffee or a pint), online (read a blog and comment, or send an email, or make some Facebook friends), but the first thing you need to know about the "emerging church" is that it's nothing more or less than a web of relationships. There is no unifying organizational structure, no unity of doctrine or practice or affiliation that binds this movement together. The thing that does unite us is relationships - friendships. I unhesitatingly guarantee that you will not begin to understand the emerging church unless you enter into that network of relationships, at least a little bit. With that in mind, let me provide some links for those interested in connecting with the emerging church, with an emphasis on folks local to the Diocese of Virginia. Emergent Village is a nationwide network of "generative friendships" - the biggest and most formal network of the emerging church in the US. But to qualify "biggest and most formal" - I believe it has exactly one paid staff member (Tony Jones, the national coordinator), a tiny budget, and no formal structure, apart from a network of small cohorts across the country. It's a big, flat web of friends, and it the main thing it generates is new connections and friendships; but also conventions, theological conversations, gatherings, and many published books. A lot of people who are part of the EC movement are connected to EV, but a great many aren't - it's not compulsory or anything. ;-) Some prominent Episcopalians like Diana Butler Bass and Phyllis Tickle are very much involved with EV. 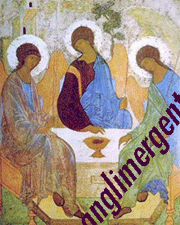 Anglimergent is an online community of folks who are both Anglican and part of the emerging church conversation. You must check it out. It was created by Karen Ward, totally awesome abbess and vicar of Church of the Apostles, a totally awesome Episcopal and Lutheran church and neo-monastic community in Seattle. If you are an Episcopalian who is interested in the emerging church, and you don't know Karen, you need to correct that oversight immediately. The Ooze is mostly an online community/network, though it periodically manifests itself in the real world in the form of Soularize conferences. It was launched by Spencer Burke. Allelon is a partnership with some pretty amazing people at its core: check it out. Missional Church, aka Mission-Shaped Church, is a movement related to emerging church that focuses on the missio Dei or mission of God in the world as the defining purpose for the church. It's an outlook that can be embraced by traditional churches much more readily than "emerging church" can. "New Monasticism" is a movement of Christians living in intentional community. It's a cousin of the emerging church movement, with lots of overlap. Finally, Pete will kill me if I don't link you to this article on emergence, as a general phenomenon of which emerging church is a particular manifestation. It's indispensable for understanding the philosophical/scientific background for the phenomenon. The other major philosophical root of emerging church is the deconstructionist postmodern philosophy associated with such 20th-century giants as Jacques Derrida. If you're interested in interpreting that philosophy for the 21st-century church, I can recommend no-one more highly than Jack Caputo and Pete Rollins. The community I'm a part of, the Church of the Common Table, meets for worship three Sundays per month at Jammin' Java (a coffeehouse / music venue) in Vienna. The fourth weekend, instead of a worship service, we gather for "service-worship", in which the entire church is invited to participate in a project that aims to serve and bless folks from our wider community. We're non-denominational (or, alternately, trans- or omni-denominational), but we have Anglican DNA (we were founded by a former Episcopal priest who later left to return to the priesthood) and we use the BCP in worship. Convergence is an emerging church community with deep roots in music and arts, which gathers for worship in Alexandria. Church in Bethesda is an emerging congregation in...you guessed it. They're over the border in Maryland, of course, but you might want to check them out. Also in Maryland is the College Park Church Plant, pastored by our friend Jason Mack. The DC Area Community of Communities is a local network of neo-monastic group houses. Some of them, including Culpeper House (where some good friends of mine live) are in Virginia; others are in DC. The local-to-DC-and-NoVA manifestation of Emergent Village is the DC Emergent Cohort. We'd love for you to drop by one of our gatherings! Revolution is a community in Fredericksburg. My friend Scott Erwin is one of its leaders. This site collects three other Emergent cohorts for Virginia: one in the southeastern part of the state, one in central VA, and one in the southwest. I don't know many of the folks in those cohorts personally, but I don't doubt that they're genuine emerging church folk (whatever that means). OK, that's about all I've got in me for tonight. If I've forgotten stuff that I should be pointing folks at (and I'm sure I have) please feel free to add additional links in the comments. Also, there's tons of good stuff in the left sidebar to this blog, if you feel like exploring, and I'd be more than happy to answer any questions you may have. God bless, and if there's just one thing I could say (again) to you, it's this: don't just read; make contact! I should clarify: the people there were very interested in emergent church, but some didn't understand it. Many had read "A Generous Orthodoxy" and other related books and found themselves excited and challenged by it. So many of them approached me afterward with a hunger for more, I knew exactly where to send them! Some of the clergy (and lay leaders!) there are already successfully incorporating emergent practices as best they can. But the number of people who came up to me afterwards with broad-ranging questions, that also covered new media as an evangelizing tool, that I promised to point them to a better authority than I on the emergent movement. These folks are curious. We shouldn't stamp down their curiosity by calling it "futile" (though I understand the frustration) but instead recognize the hunger and feed them! I WAS interested in emerging church but if this is a sample of the reception I will get - think I will stick to something else. I thought following Christ was about welcoming the stranger? Sorry if we are not asking the correct questions or the correct people -- just trying to start someplace. Sounds like we were doing mutual reactivity - I understand your main point -- about the importance of incarnation rather than studying something. Thanks. Neat! Seems like a cool chap. So it seems as if a log of folks from outside DioVA come to the DioVA Annual Council? I had no idea. I was one of those people in the room where there was the beginning of a discussion about what the emergent church might have to offer us. To me, there were two levels of conversation Friday evening.... the folks who phrased their sentences by talking about emergent church as "the other"... "what is it" "who are they?" Sunday morning as our delegation reported back on our council experience I tried to capture what I'd done Friday evening instead of attending the meetings on Canon or R-5. Thanks for posting the information and links. The dialog continues. "X is invalid" vs. "Y is [also] valid"